Traditionally, “mountaintop experience” refers to a life-changing moment of transcendence. In the airy, open spaces of Building C on Lehigh University’s Mountaintop campus, the term has seemed appropriate since 2013. That’s when Lehigh launched the Mountaintop Initiative, a then-experimental program in which students work across disciplines on independent projects and inquiries guided by personal passions and ideas about how they can change the world. 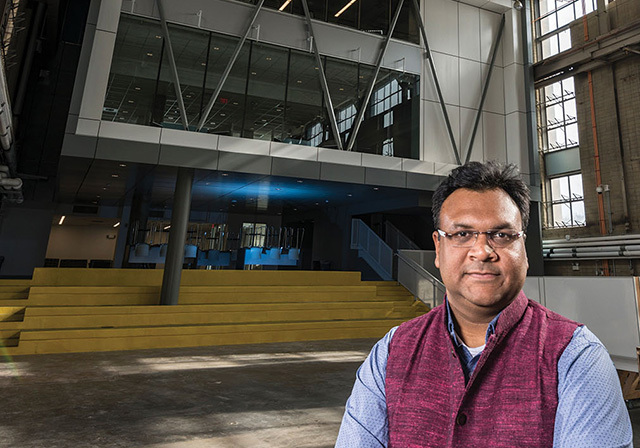 Mehta is now directing efforts to expand on Mountaintop’s successful approach to learning and weave it into education throughout the university. In his newly created position, he aims to promote and integrate creative inquiry into academics as well as high-impact learning practices, which include internships, research, global learning, entrepreneurial experiences, community-based learning and engagement, and other methods of experiential enlightenment. Undergraduates who engage in such practices—expanding education beyond classroom boundaries to experiences that have tangible effects in the larger world—have been shown to boost their academic achievement, enhance personal development, strengthen interactions with faculty, and cultivate lifelong career success. In short, they’re better prepared for what comes next, whether it’s joining the workforce, pursuing advanced degrees, seeking fellowships, or chasing entrepreneurial dreams. Based on conversations with a wide array of stakeholders, Mehta says high-impact learning practices have significant potential for growth at Lehigh. He estimates that half of students are already at least moderately engaged in some type of high-impact learning practice such as internships, research, and entrepreneurial experiences, with about 20 percent fully engaged in multiple practices with a clear emphasis on outcomes and transferable skills. Inspiring the remainder of students to more fully embrace hands-on learning experiences depends in part on shifting attitudes away from a transactional mindset in which students emphasize graduating on time with a diploma and high GPA, and toward mindsets that emphasize approaches to life or problems. Such mindsets may include creative inquiry, ethical decision-making, global citizenship, coalition building, an entrepreneurial approach, or a systems thinking outlook. Mindset-driven learning readily leads to skillsets that the World Economic Forum identifies as crucial for thriving in the coming world of advanced robotics, artificial intelligence, machine learning, autonomous transport, advanced materials, biotechnology, and genomics. Topping the WEF’s skillsets list is complex problem solving. Other vital skillsets include critical thinking, creativity, people management, emotional intelligence, and service orientation. Mehta steers students toward problems that have not been solved yet. “I help them meet the five-minute Google test,” he says. “If they send me a proposal and I easily find 10 similar projects, I help them find a unique niche, context, or combination in which ideas might have more merit. My job is not to say, ‘No,’ but, ‘Here’s another way to look at it or here’s another intellectual pathway worth pursuing’.” Successful projects tend to work across multiple disciplines, cultures, and ways of thinking and being. One group of students is working to design and produce inexpensive test strips that can screen for urinary tract infections in developing countries such as Sierra Leone. “Can it be done with engineering alone?” Mehta asks rhetorically. “It cannot. Students can learn in classes how to design biomedical devices or they can study community health, but this takes theory from the classroom in both disciplines and puts it into practice.” The team includes a science and engineering subgroup that focuses on chemistry and product design issues. Other sub-teams focus on distribution, supply chains, customer education, regulatory compliance, and other issues. Sustainability also drives collaboration between three students and four faculty members who are researching new ways to recycle drywall gypsum. Most of the estimated 700,000 tons of it generated in the Eastern U.S. alone is either transformed into low-value products such as soil amendments or dumped in landfills. The team, led by Jonas Baltrusaitis, assistant professor of chemical and biomolecular engineering is working on laboratory methods to re-use and repurpose drywall gypsum into high-value products such as fertilizer, artificial bone substitute, or glass-ceramics for tissue engineering. Beyond piloting new courses such as Creative Inquiry Independent Projects and Inquiry to Impact Group Projects, Mehta is working to create multiple ways to start students on a journey of creative inquiry in which they’re emboldened to ask questions and risk failure to get answers. One example is LearnX-MakeX-SprintX workshops in which students can explore a wide range of unfamiliar topics or use unfamiliar equipment or processes to make something tangible with their own hands. Another is a network of open and accessible creative spaces. “These might be a conference room, a studio to make a video clip, or a dirty space to work with cement or sculpture,” Mehta says. “Our team is trying to carve out spaces where we can create new things.” Venues for sharing—such as a university-wide project expo planned for May 3 at Mountaintop—can showcase and celebrate accomplishments while inspiring others and cross-pollinating ideas.